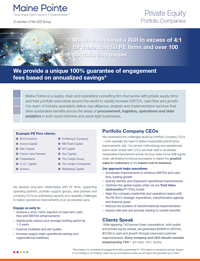 We understand the challenges faced by Portfolio Company CEOs – more specially the need to deliver measurable performance improvements, fast. Our proven methodology and experienced teams work closely with CEOs and their staff to accelerate measurable improvement across the buy-make-move-fulfill supply chain by eliminating functional boundaries to deliver the greatest value to customers at the lowest cost to business. Maine Pointe was challenged with aligning company leadership and operations teams with the PE firm's strategic objectives and delivering on transformation and financial goals. This resulted in procurement cost savings ranging between 18%-30% and and annualized EBITDA saving of $5.9M. Welch Goggins, President and CEO, Cleaver-Brooks Inc. I would recommend Maine Pointe to any organization looking to optimize their supply chain capabilities." In our recent survey, Maine Pointe asked 50 private equity managing partners, partners and senior directors in the US and Europe to share their views on the effectiveness and financial impact derived from the use of operating partners. Maine Pointe’s comprehensive set of pre and post-acquisition due diligence offerings and implementation services help improve your confidence, competitiveness and time-to-value creation. Have a particular business challenge you would like to discuss? > Contact us to talk it through with one of our executives.